I grew up watching my mother in the kitchen and learning to cook from her and I am SO grateful to her for teaching me. I think it’s important that kids learn their way around the kitchen from an early age so I always made sure to show mine what I’m doing and had them helping from the time they were little. I’m so happy that Olivia and Audrey are old enough now to cook on their own and have started trying new recipes. 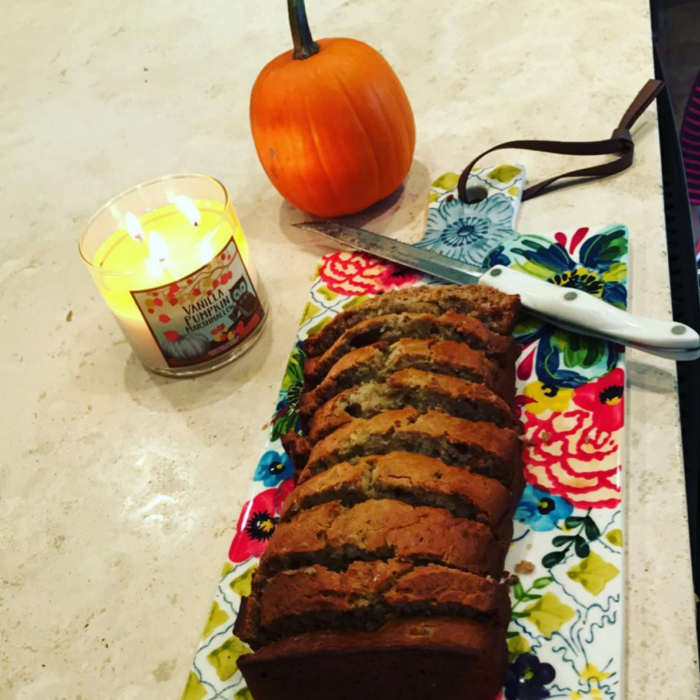 I was outside yesterday enjoying a gorgeous Fall Southern Sunday afternoon and to my surprise, Olivia and Audrey were in the kitchen cooking up some banana bread. We try to be smart about eating healthy when we can, so they found a recipe online that reduced some of the fat and cut out some of the salt, but let me tell you that the flavor wasn’t lacking at all! So as I brag about my girls and their successful loaf of banana bread, here’s the recipe if you want to try it yourself at home. Happy Fall! 1. Preheat oven to 350 degrees F (175 degrees C). Lightly grease a 9×5-inch loaf pan. 2. Combine flour, baking soda, and salt in a large bowl. Beat butter, yogurt, and brown sugar with an electric mixer in a large bowl until light and fluffy. The mixture should be noticeably lighter in color. Add room-temperature eggs one at a time, allowing each egg to blend into butter mixture before adding the next. Stir in mashed bananas until well blended. Pour banana mixture to flour mixture; stir just to moisten. Transfer batter into prepared loaf pan. 3. Bake in preheated oven until a toothpick inserted into center of loaf comes out clean, 60 to 65 minutes. Let bread cool in pan for 10 minutes, then turn out onto wire rack to cool completely.